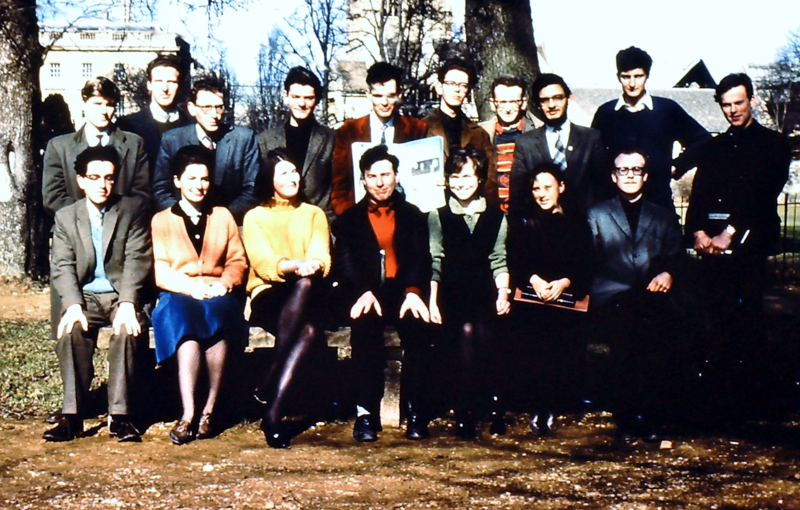 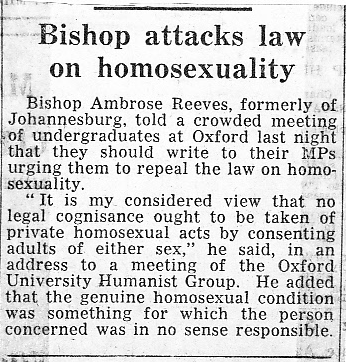 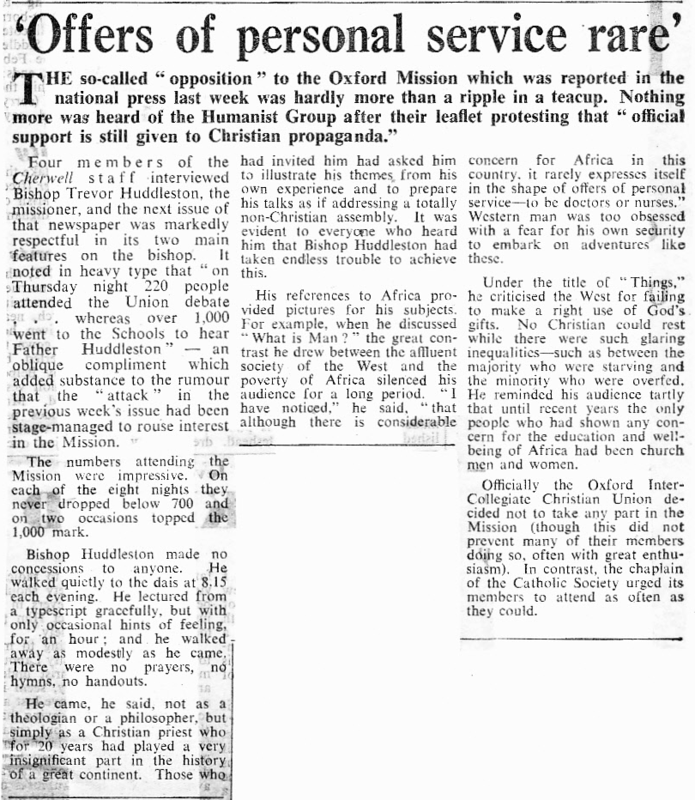 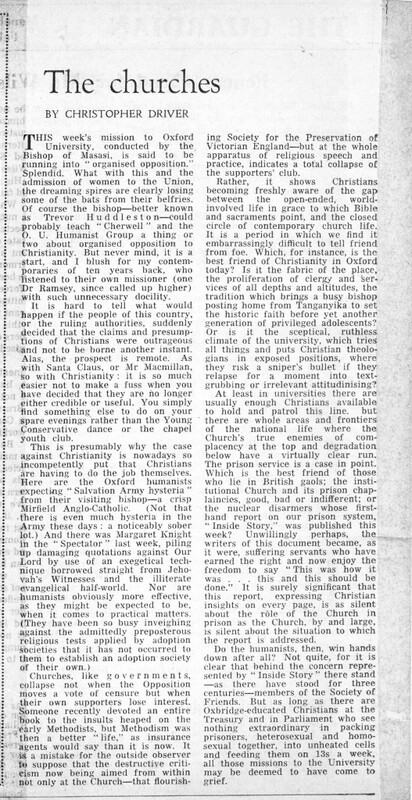 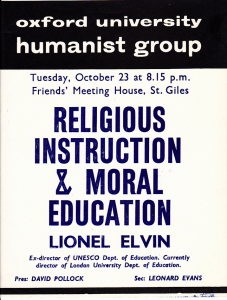 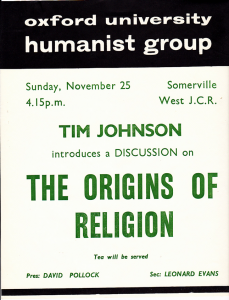 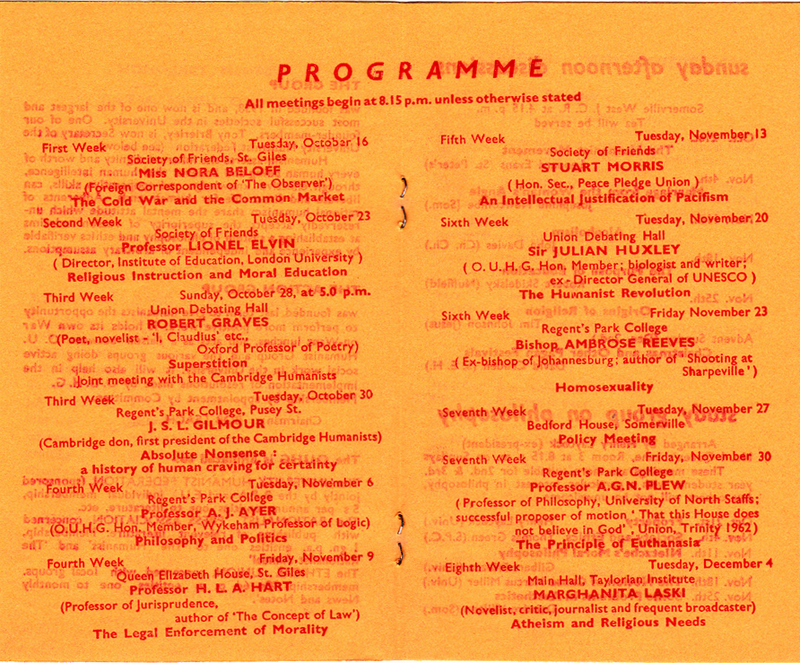 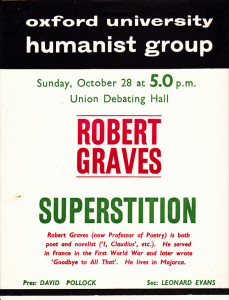 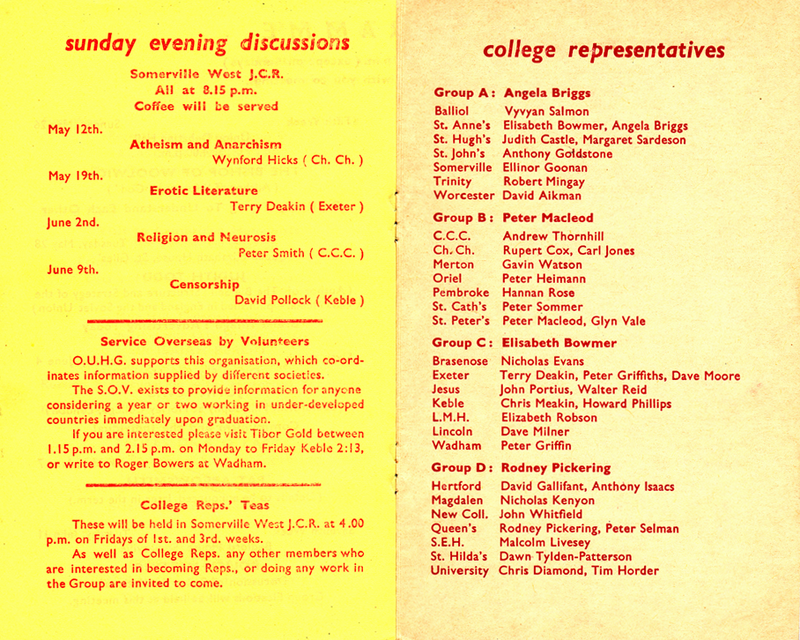 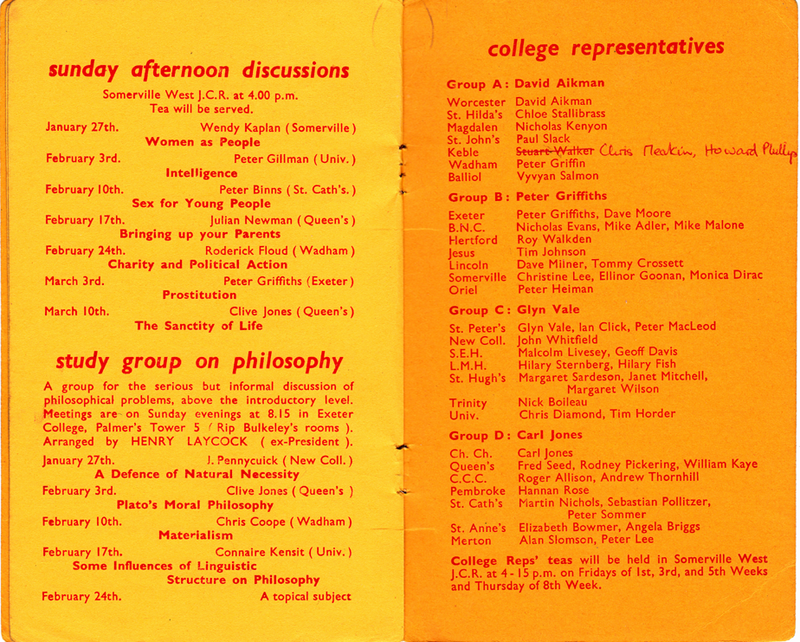 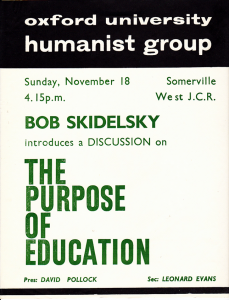 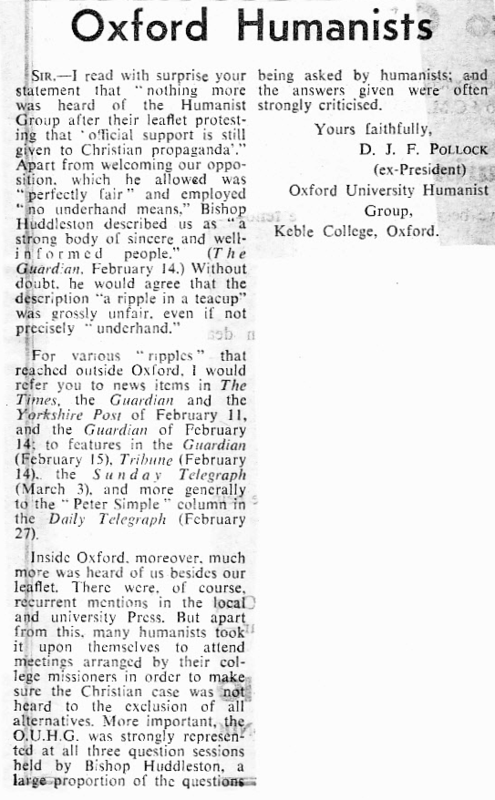 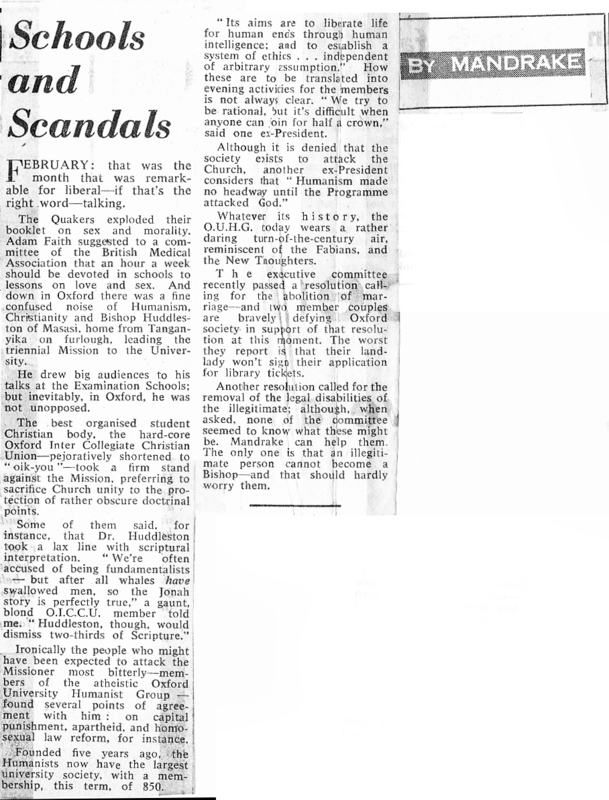 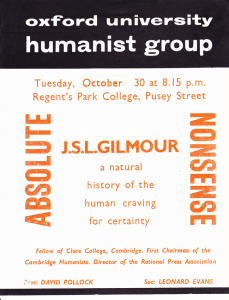 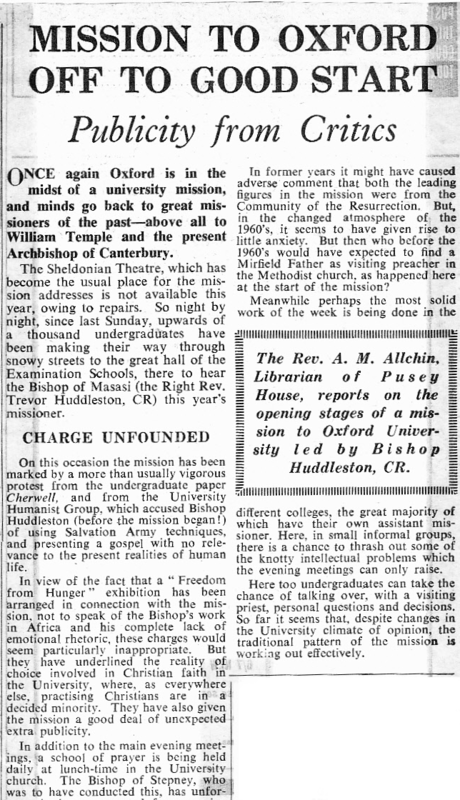 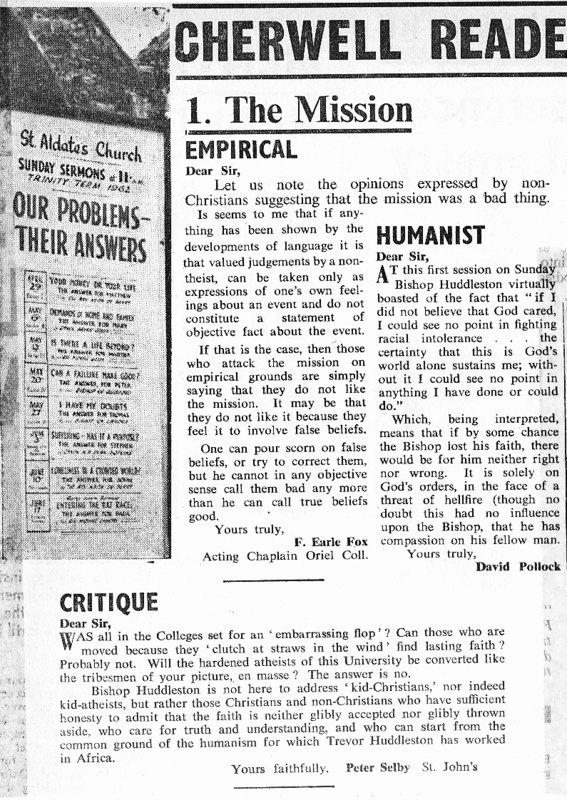 On 30 October 1962 The Times acknowledged in a long article headed “Oxbridge Freshmen ‘Deluged’ with Religious Tracts” that though the strength of the evangelical OICCU and its Cambridge counterpart CICCU was undeniable, “neither can boast as large a membership as the humanist groups, which attract students outside any organized religious body”. 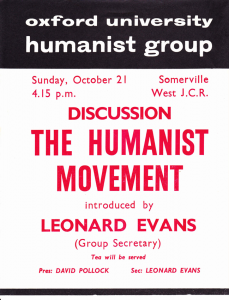 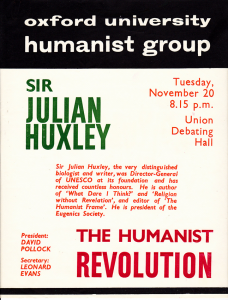 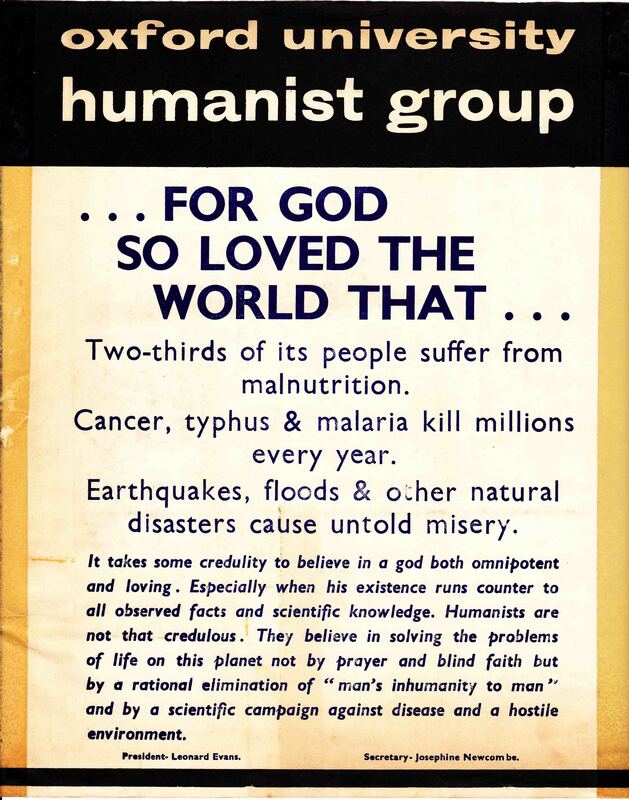 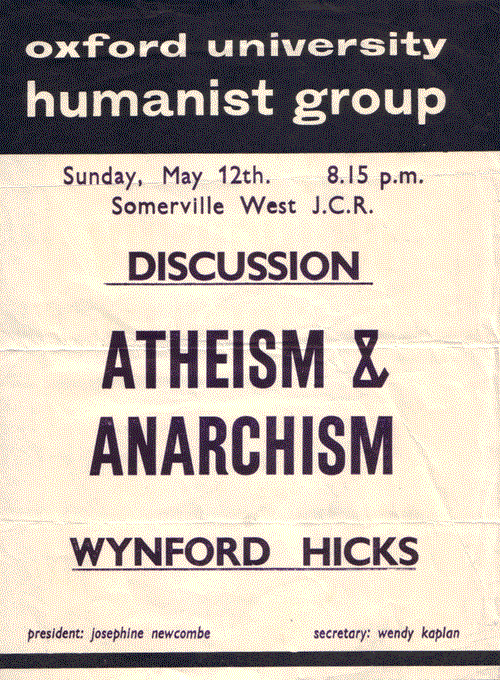 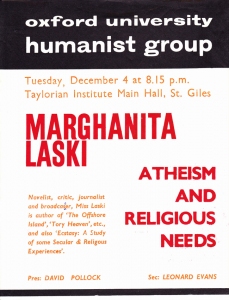 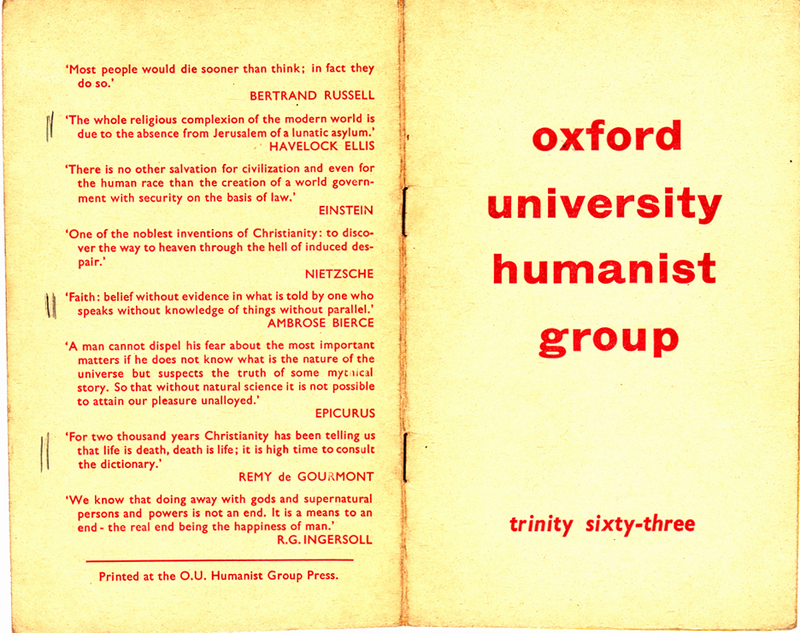 This copy is from a sadly faded wet-process photocopy: see second column under cross-head “Humanists’ Strength”. 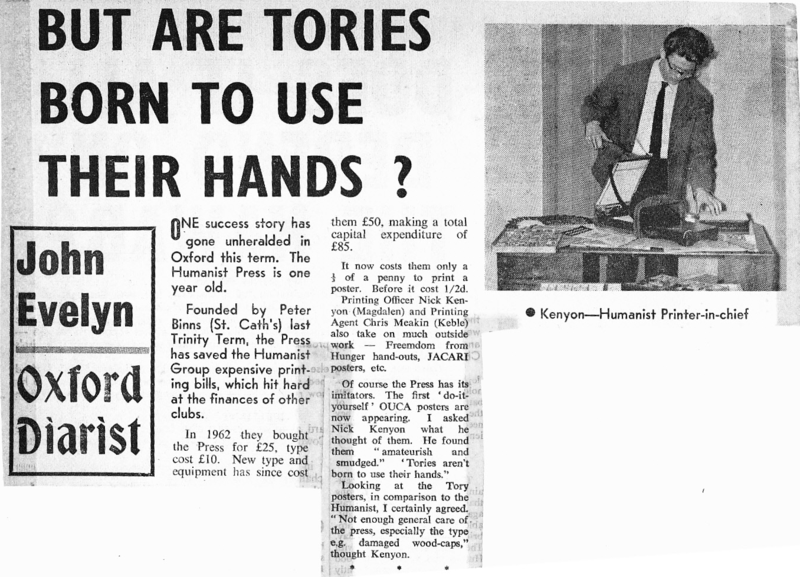 In Trinity 1962 the OUHG bought an Adana flatbed printing press. 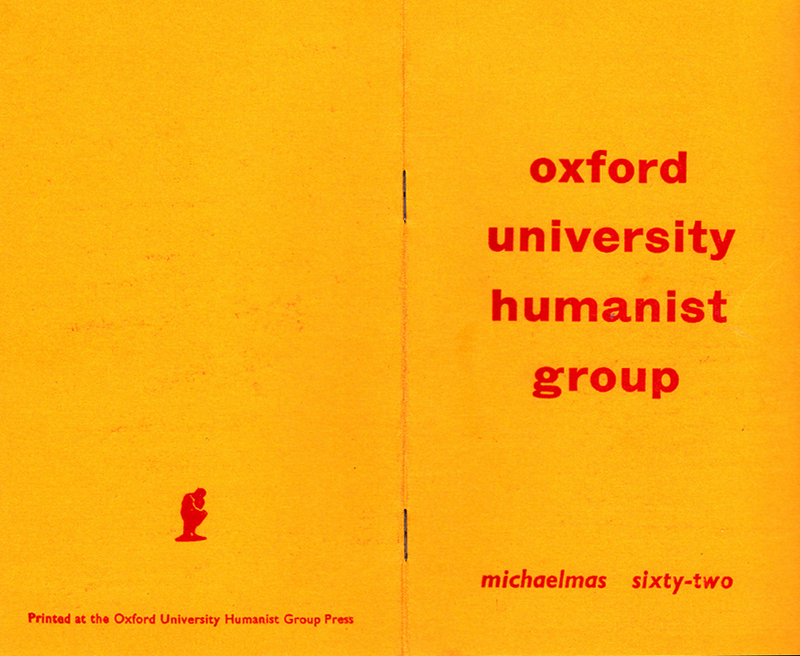 This was the initiative of Pete Binns, the OUHG’s first printing officer, who had learnt his skills at school. 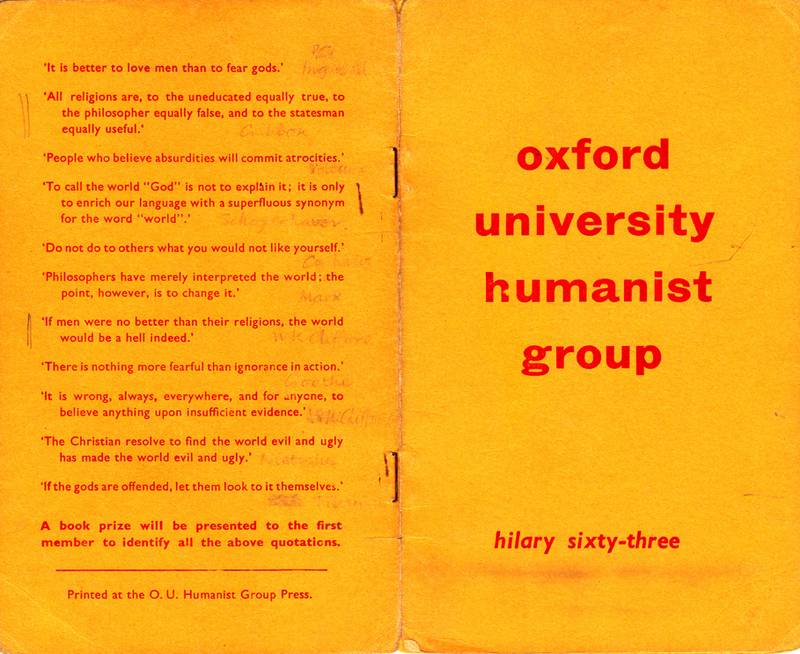 It was henceforth used for termly cards and posters for the Group’s meetings and OUHG also took in work from other university clubs and societies. 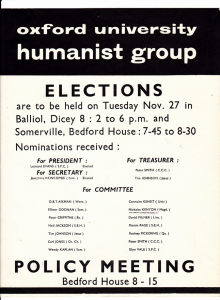 Josephine Newcombe was president, Wendy Kaplan secretary and Peter Griffiths treasurer. 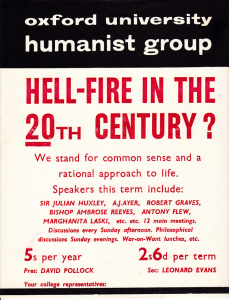 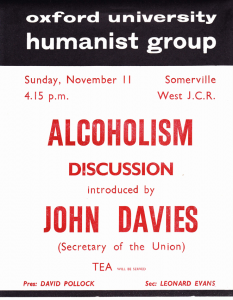 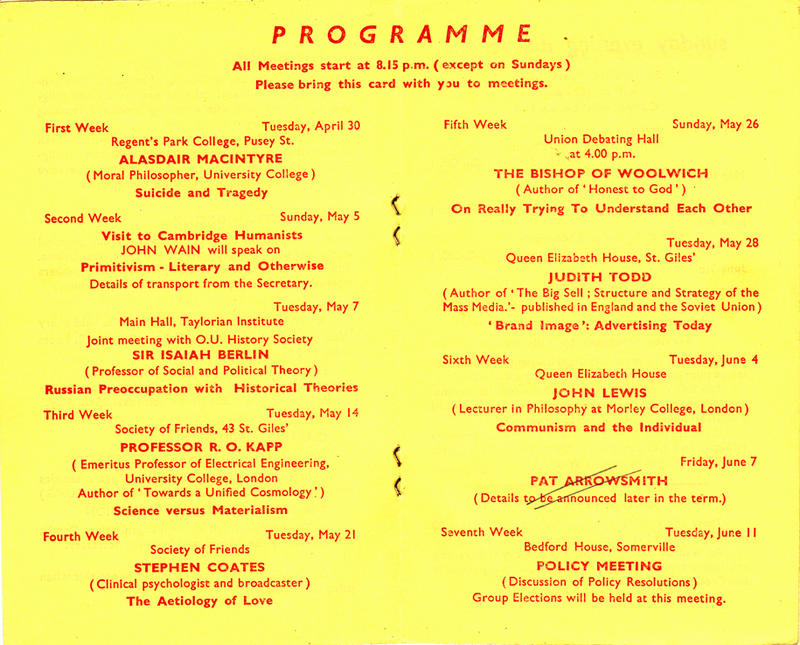 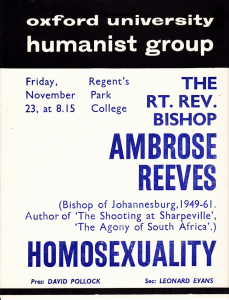 Speakers included Alasdair MacIntyre, Isaiah Berlin, and John Robinson, the Anglican bishop of Woolwich whose book Honest to God was making waves. 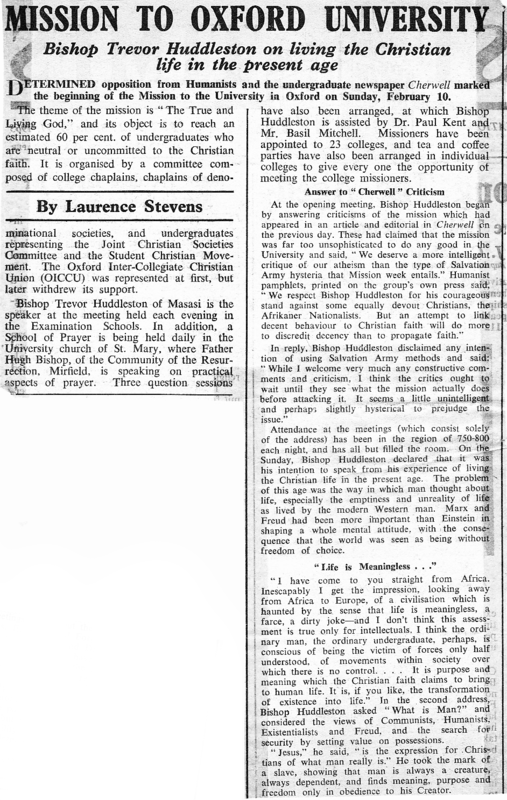 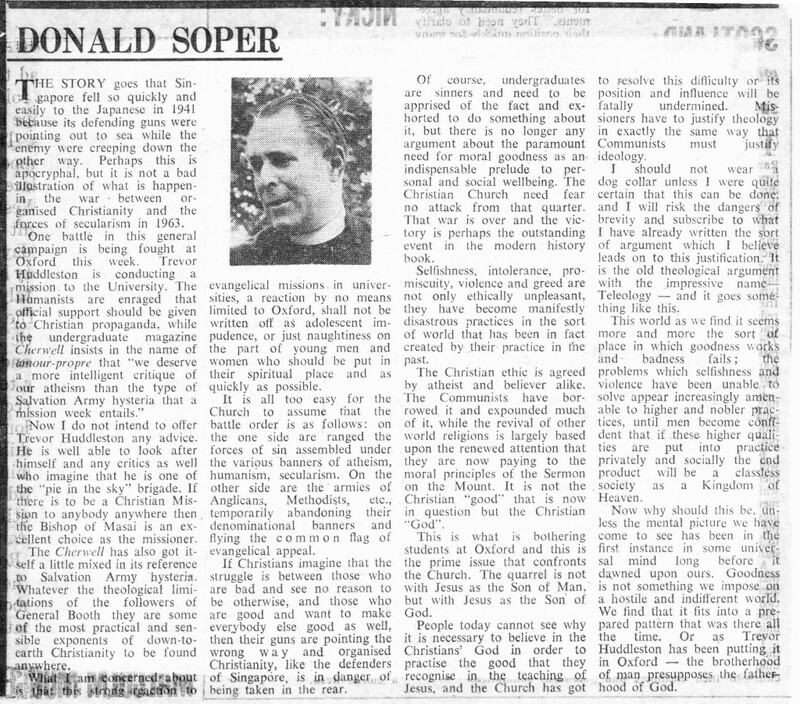 There was press coverage both of meetings – in particular a series of lengthy reviews in Isis – and of a variety of other topics, serious and otherwise The term also saw the publication by the Church of England Newspaper of an article by ex-president David Pollock on Why I am not a Christian. 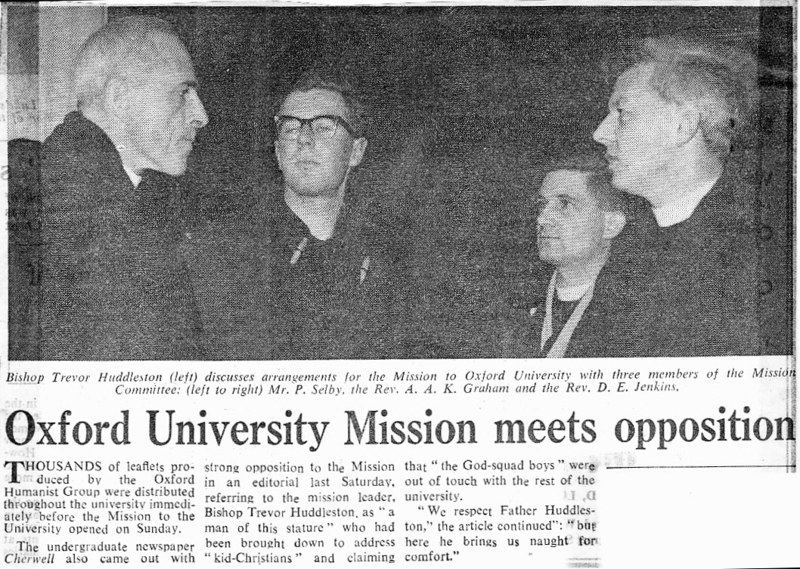 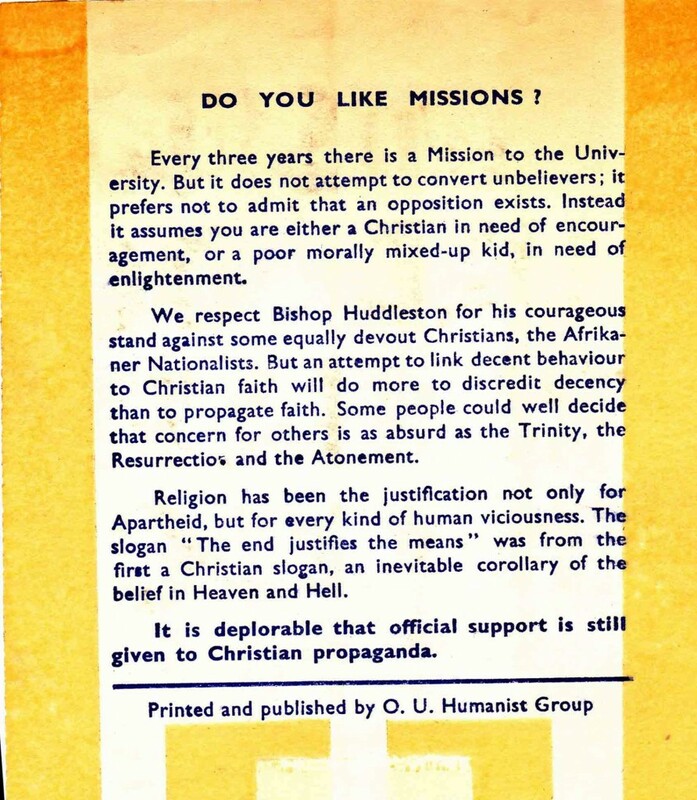 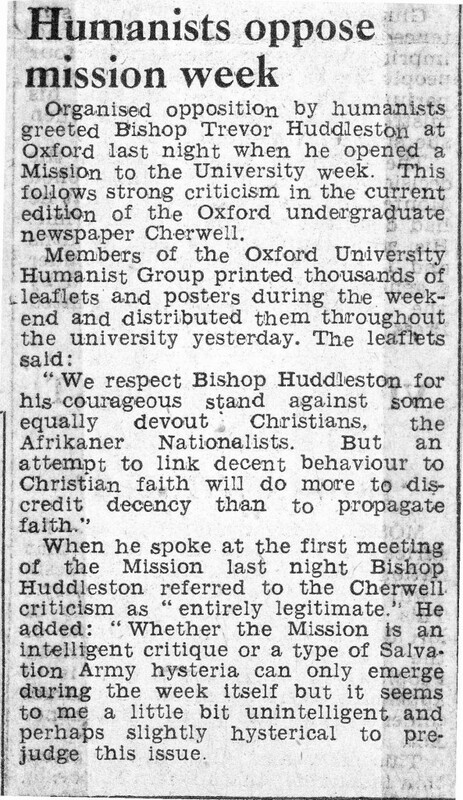 Cherwell (9 February 1963) had run its own critical editorial, in which it appeared to believe the mission was being run by the shiny-faced evangelicals of OICCU (Oxford Inter-Collegaite Christian Union) rather than the relatively thoughtful SCM: in fact, OICCU boycotted the mission! 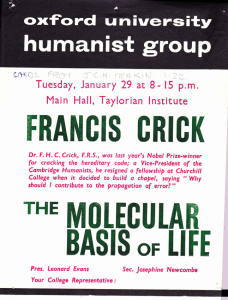 Speakers included Francis Crick, Barbara Wootton, J D Bernal and Cyril Bibby. 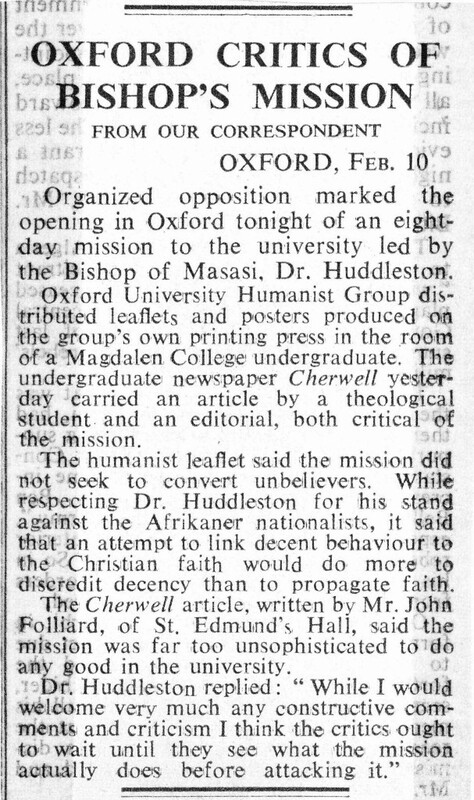 plus some more routine press coverage. 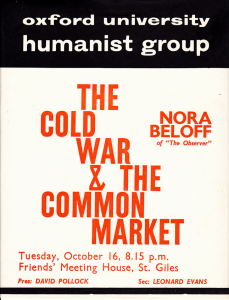 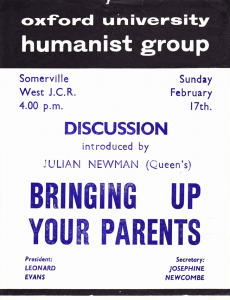 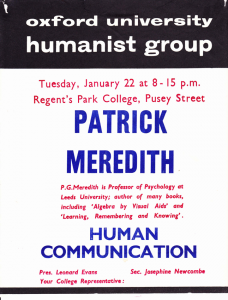 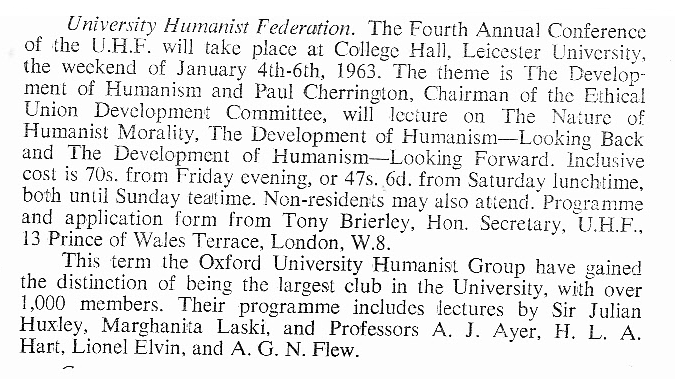 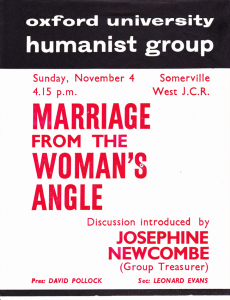 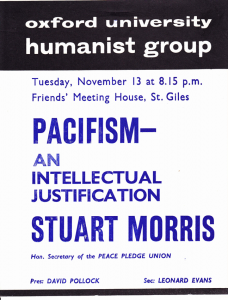 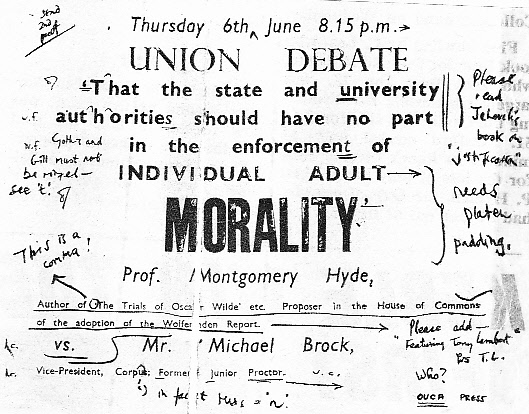 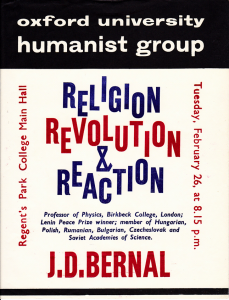 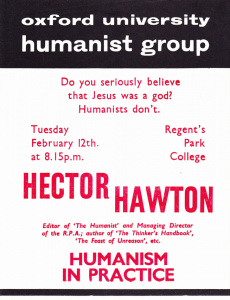 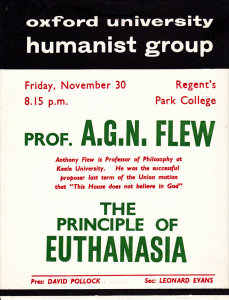 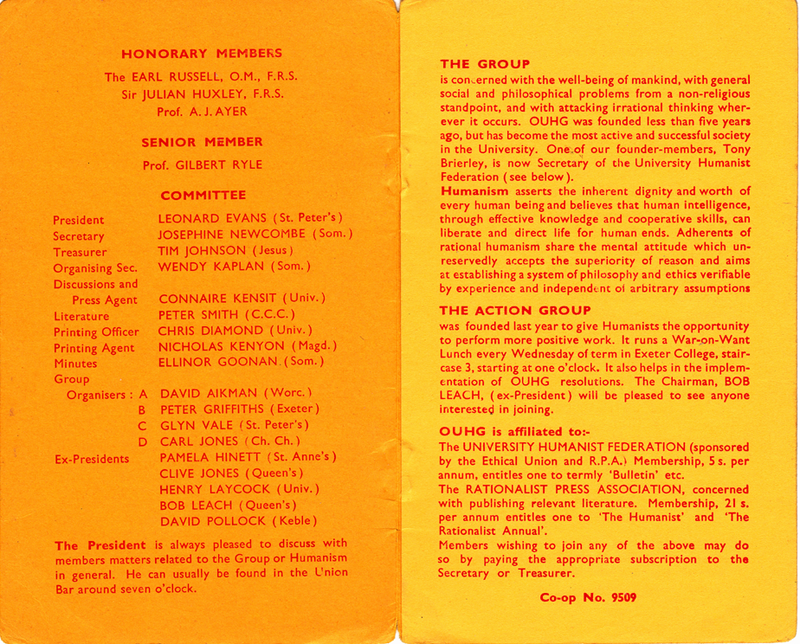 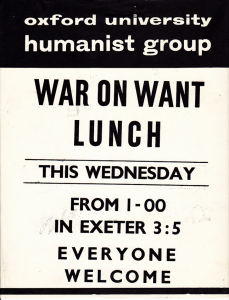 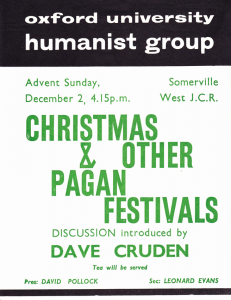 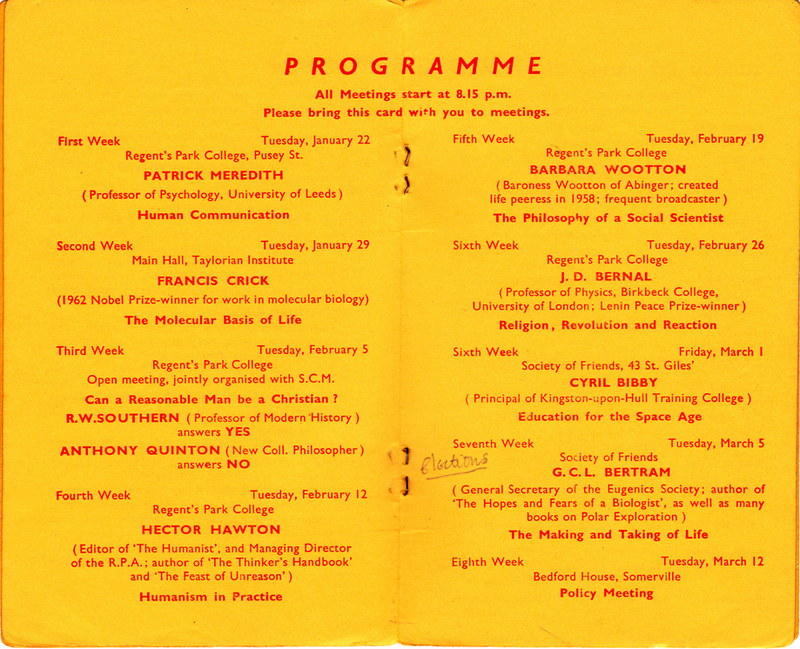 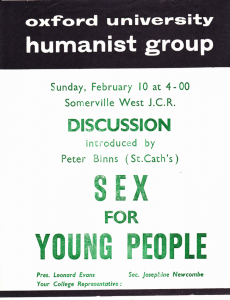 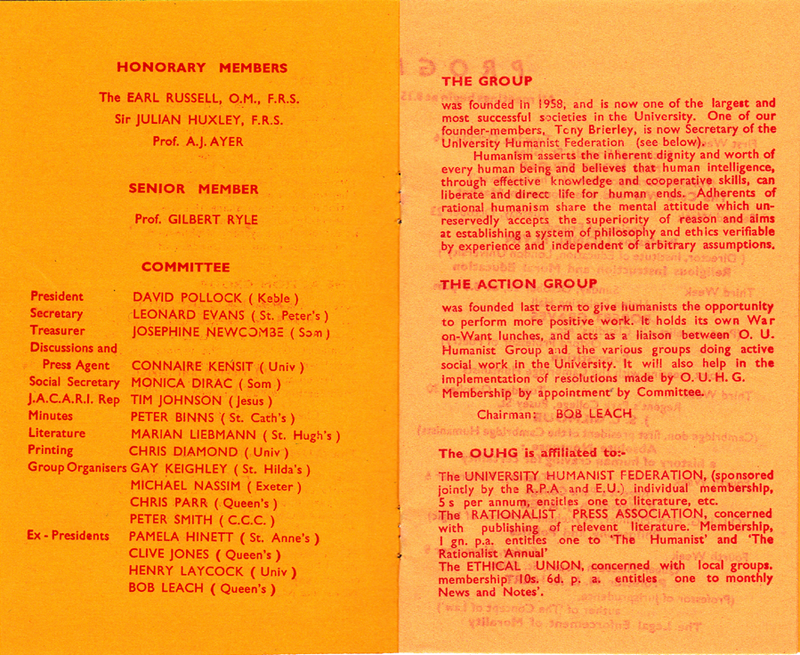 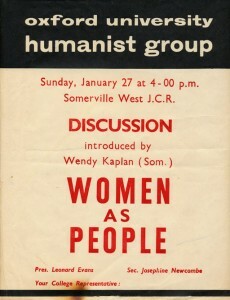 Barbara Wootton produced a text for her talk on 19 February which was published in the University Humanist Federation Bulletin for Autumn 1963 and reprinted in The Freethinker of 13 December 1963. 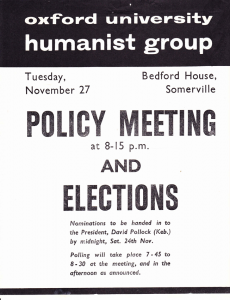 David Pollock was president, Leonard Evans secretary and Josephine Newcombe treasurer. 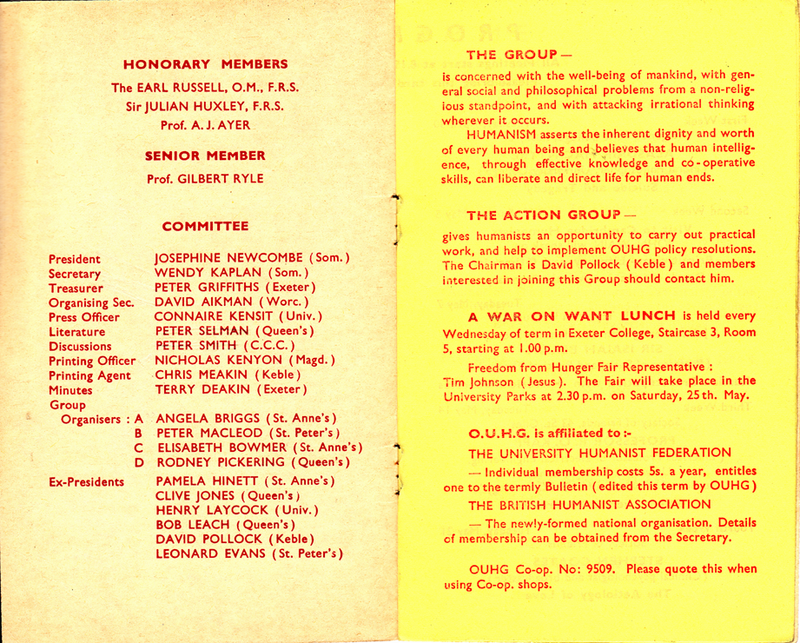 The term saw the OUHG’s biggest ever membership, over 1,200. 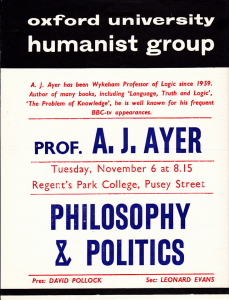 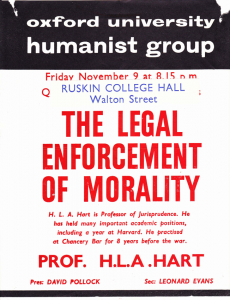 Speakers included Robert Graves, Professor A J Ayer, Professor H L A Hart, Sir Julian Huxley and Marghanita Laski. 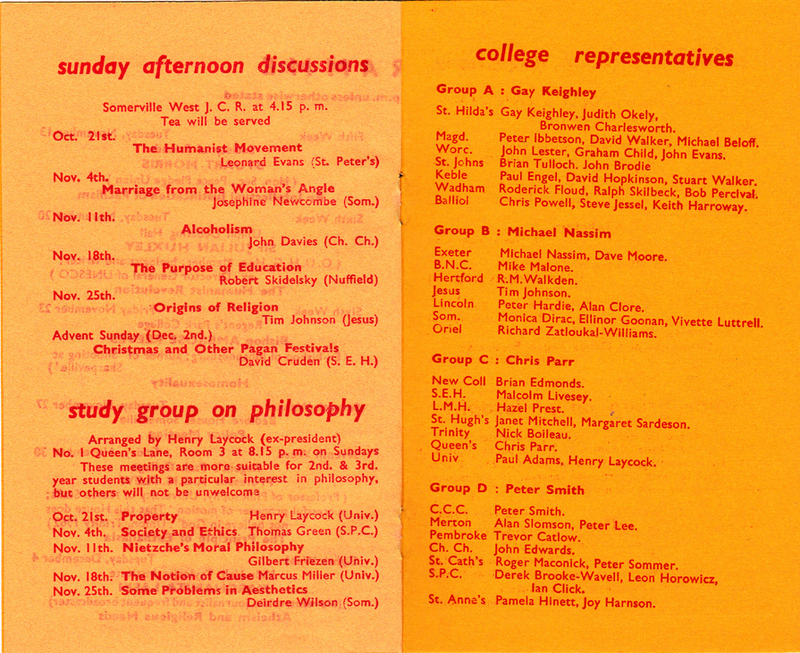 The inside pages of the termly card were printed on paper that was too thin, so that they suffered from print-through. 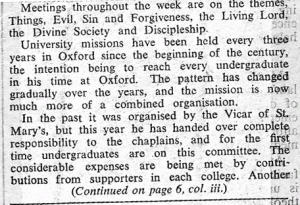 See here for surviving posters for the term and here for press coverage during the term..